"Change of Rural Society and Local Agro-ecological Knowledge in Myanmar"
Rural Development Programs in terms of society and production have been required for the rural people, especially, in developing countries in Asia for materializing their development or modernization. The social reconstruction programs have been largely implemented under the International Cooperation since 1950s just after the Second World War. The modernization or westernization was unconditionally believed to up-grade the livelihood of rural peoples rapidly. However, in 1980s, as the imitation of resources and the unexpected minas-effect for rural societies has appeared clearly in the world, the paradigm of rural development has been shifted unlimited progress dream given by the state government to the sustainable development based on the peoples' participation. Before 1980s, in the paradigm of rural development, the people would see the only futures' themselves and forget the existence as continuation in a history. This paradigm learned toward the economic development. The alternative paradigm is that a historical perspective is important to integrated and holistic development by employing the wisdom and knowledge ingerited among rural peoples to maintain social systems, resource management and production technologies etc. It would be noticed that Myanmar has an advantage in preparing the alternative rural development program based on her own rural social systems and resources management. In this connection the joint study project with a historical perspective on the "Historical Development of Rural Societies and Villager's Livelihood in Myanmar: From Tradition to Modernity" is much required as a basic academic exercise. 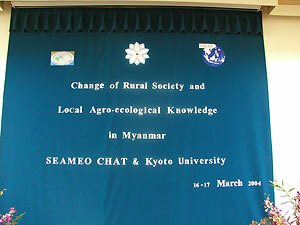 SEAMEO-CHAT and CSEAS (Center for Southeast Asian Studies), Kyoto University has accordingly started the first phase of the above joint study project since 2000 in closed collaboration with University of Yangon, University Historical Research Center and ASAFAS (Graduate School of Asian and African Area Studies), Kyoto University. We have employed the village-based field research with integrating the natural and human science. The Gwa Township, Rakhine state was selected main field site because of its remoteness and cultural and ecological complexity. The other sites including Bago etc. are studied especially for Forestry Livelihood. We have aimed the following three main objectives to understand how rural people can live with continuity of their tradition, culture and history under changing rural socio-economic circumstances. (1) To understand the holistic rural livelihood in the context of historical perspective of introduction of modernization initiated under British colonization and its effect at the present. (2) To make a set of database for locally available wisdom and knowledge in social management and rural resource in the traditional life style of rural peoples. (3) To identify the potential of a rural history as one of tools of designing the rural development program. We would like to discuss about our interim findings with the participants from the relevant Government Officials, Scholars in Myanmar, Japan and SEAMEO Member Countries and also believe the outcome of the workshop will contribute to build the Myanmar Approach of Rural Development as an alternative paradigm.